Old pictures can be new treasures. Photography gems. We all have pictures that we haven’t seen in years – wonderful pictures tucked away in boxes or plastic sleeves – out of sight – out of mind – aging. 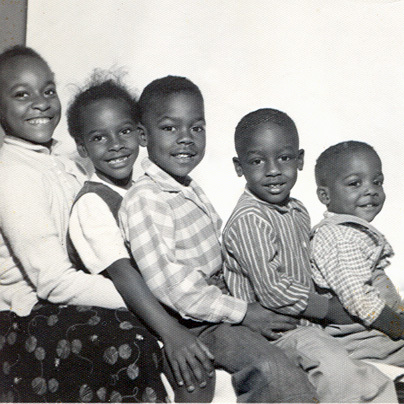 The other day when I was looking for a new picture for my Face Book profile I came upon an old picture of me and some of my brothers and sisters. There are 8 of us and 5 of us are in the picture. The picture was not in the best condition but with the help of Photoshop it became almost new again. I like the way the photographer posed us and the old style clothes we were wearing. I would encourage folks to take the time to go through boxes of pictures presently stored away and you might be surprised at what treasures you have. This entry was posted in Life, People, Portraits and tagged family, old pics, photography, siblings. Bookmark the permalink. That’s me in the middle. Thanks for visiting the blog.